Global2030 provides information and suggests action on the most urgent global challenges of the 21st century. Global2030 will collaborate with experts, scientists, artists as well as with decision-makers in politics, business and non-governmental organizations. Global2030 operates as a platform for strengthening action on global issues like hunger, climate change, etc. Today is International Day for Biological Diversity: One third of global protected land is under intense human pressure. The MDG target to reduce the loss of biodiversity was missed in 2015, so will we manage to halt the loss of biodiversity as aimed for in SDG 15? Today is UN World Bee Day: Caring for bees and other pollinators is part of the fight against world hunger. Pollination of crops and other plants is best ensured by an abundance and diversity of pollinators, such as the 25 000 to 30 000 species of bees. New data: 91% of the world's population breathed polluted air in 2016 (breaking WHO air quality guidelines). Outdoor air pollution has remained approximatively stable over the past 6 years globally. It was responsible for a death toll of 4.2 million people in 2016. Indoor air pollution due to cooking or heating with open fire resulted in 3.8 million deaths in 2016. It is Safe Work Day! Occupational diseases and accidents claimed 1.53 million lives in 2016, 8.4% more than in 2006. Trend is opposite to aims of SDG 8 on decent jobs. Source: GBD study in The Lancet magazine . Global2030 offers internship/volunteering placements for fundraising or research/statistics on global issues: fundraising ad on Indeed , research/statistics ad on GreenJobs . Today is Chernobyl Disaster Day, marking the nuclear disaster with the worst human impact in history, including thousands of deaths (International Chernobyl Disaster Remembrance Day). Today is World Malaria Day. Malaria killed 720 000 people – mainly children – in 2016, 10% less than in 2006. The MDG target to halt malaria by 2015 was met and substantially exceeded. Will we also achieve the SDG target to end malaria by 2030? Sources: GBD study , Global2030. World Immunization Week starts today. Due to measles vaccination, measles deaths dropped 84% between 2000 and 2016 worldwide. neonatal disorders: 1.73 million deaths. Today is World TB day: Tuberculosis killed 1.2-1.4 million people in 2016. TB is the world´s second-biggest infectious killer, after pneumonia. Drug-resistant tuberculosis claimed the lives of 127 000–240 000 people in 2016 (MDR-TB, MDR/RR-TB). Sources: GBD study , WHO . New data: Global energy-related CO2 emissions managed to remain steady for three years, but grew by 1.4% in 2017, reaching 32.5 billion tonnes. Progress of energy efficiency slowed in 2017: from an annual 2.3% improvement in energy intensity of economic output over the three years since 2014, it fell to 1.7% in 2017. Renewables saw the highest growth rate of any energy source in 2017, meeting 1/4 of global electricity generation. March 22 was World Water Day: Unsafe water sources killed 1.16 million people in 2016. The top 4 global risks 2018 as ranked by the World Economic Forum are extreme weather events, natural disasters, cyberattacks and failure of climate change mitigation and adaptation. New data: 2017 second-hottest year after 2016, together with 2015, and the warmest year without an El Niño. 1.1° Celsius above the pre-industrial era. New data: Natural disasters killed approximately 10 000 people in 2017, much below the 10-year average of 60 000. Natural disasters in 2017 cost $330 billion in terms of economic losses, the second-highest figure ever (inflation considered). Of these losses, only 41% were insured. The costliest disasters were hurricanes Harvey, Irma and Maria, together causing economic losses of $215 billion. Sources: MunichRe fact sheet , MunichRe press release . Today is International Migrants Day: In 2015, there were an estimated 244 million international migrants and 22.5 million refugees globally. Global challenges such as poverty, conflict, natural disasters and climate change are drivers of migration. The Right to Food is not realized for the 815 million undernourished people globally. Furthermore, 20% of the world´s population do not have access to safe water, meaning their Right to Water is not realized. The Right to Health is, for example, not fully realized for the 216 million people – mainly children – who suffer from malaria, a preventable disease. Sadly, 5.6 million children under five are even denied their Right to Life. Sources: FAO , Global Burden of Disease study , WHO , UNICEF . World Soil Day is today: 33% of global land is moderately to highly degraded due to the erosion, salinization, compaction, acidification and chemical pollution of soils. Today is the International Volunteer Day for Economic and Social Development. Global2030 volunteers are supporting research on global challenges and progress in tackling them. Today is World AIDS Day: AIDS killed 1.0 million people in 2016, down from a peak of 1.9 million in 2005. The number of new HIV infections is decreasing. It was 1.8 million in 2016. Approximately 36.7 million people were living with HIV in 2016. Their number is slowly increasing, due to the fact that thankfully mortality has been reduced more successfully than new infections have been. 20.9 million people infected with HIV received antiretroviral therapy in 2017, almost three times as much as in 2010. Sources: UNAIDS , Global Burden of Disease study . Intimate partner violence claimed the lives of 65 000 women in 2016. Today is International Day for the Elimination of Violence against Women. 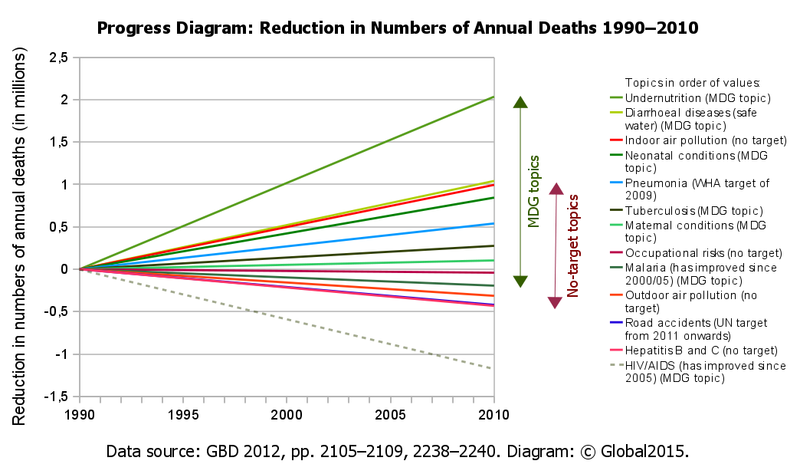 Source: Global Burden of Disease (GBD) study in The Lancet magazine . Today is Universal Children Day: undernourishment is still the no. 1 child killer, with 2.74 million deaths in 2016. It is time to realize children's right to food! Road accidents killed 1.34 million people in 2016 worldwide. World Day of Remembrance for Road Traffic Victims on Nov 19. Nov 19 was World Toilet Day: unsafe sanitation spreads disease and claimed 898 000 lives in 2016. Scientific facts and solutions are integral in tackling global challenges. Today is World Science Day for Peace and Development. Today is the International Day to End Impunity for Crimes against Journalists. "The attacks on journalism are widespread and deplorable and they undermine official accountability and help entrench corruption and other abuses of power." Source: Agnes Callamard, UN Special Rapporteur on extrajudicial, summary or arbitrary executions, and David Kaye, UN Special Rapporteur on the promotion and protection of the right to freedom of opinion and expression , both at the office of the UN High Commissioner for Human Rights. Current commitments under the Paris Agreement will likely result in 3°C in global warming instead of maximum 2°C; they are only one third of the reductions needed to meet the 2°C target. Sources: UNEP press release , UNEP Emissions Gap Report . New data: C02 concentrations increased to 403.3 ppm in 2016, 45% above pre-industrial levels and the highest in 800 000 years. Out today: 10.4 million people fell ill with tuberculosis in 2016. Tuberculosis incidence is falling by 2% per year but not on track to meet the target to end TB by 2030. 490 000 cases of multidrug-resistant tuberculosis occurred in 2016, and 110 000 cases resistant to the major drug. Tuberculosis claimed the lives of 1.3 million people in 2016, down from 1.7 million in 2000. Tuberculosis is the second biggest infectious killer, only surpassed by pneumonia (lower respiratory infections). Sources: WHO TB Report , WHO GHE . More posts on Facebook , Google+ or Twitter . 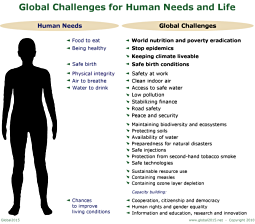 The Global2015 draft survey summarizes the most urgent issues for human life and needs. The information is exclusively drawn from reports of scientific institutes, UN (United Nations) organizations, national departments, and other trustworthy sources. Everyone is welcome to contribute ideas and suggestions to the further development of the draft overview on main global challenges. Please use the contact page. Furthermore, Global2030 approaches scientists and experts to review the draft. After being reviewed, the completed survey report on global challenges will be published here. The purpose of the survey is to inform and motivate decision-makers in particular, but also the public, to increase their efforts to tackle the global challenges addressed. Photo credit: © Mihai Eustatiu .